Shearing is a metal fabricating process used to cut straight lines on flat metal stock. During the shearing process, an upper blade and a lower blade are forced past each other with the space between them determined by a required offset. Normally, one of the blades remains stationary. Its ability to cut relatively small lengths of material at any time since the shearing blades can be mounted at an angle to reduce the necessary shearing force required. The illustration that follows provides a two-dimensional look at a typical metal shearing process. Note how the upper shear blade fractures the metal workpiece held in place by the workholding devices. The sheared piece drops away. Typically, the upper shear blade is mounted at an angle to the lower blade that is normally mounted horizontally. 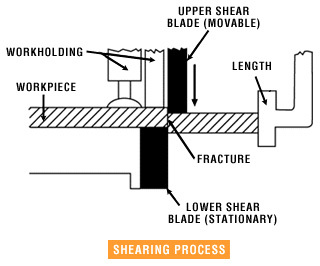 The shearing process performs only fundamental straight-line cutting but any geometrical shape with a straight line cut can usually be produced on a shear. Metal shearing can be performed on sheet, strip, bar, plate, and even angle stock. Bar and angle materials can only be cut to length. However, many shapes can be produced by shearing sheet and plate. Laser cutting is a precise method of cutting a design from a given material using a CAD file translated into Numerical Code (NC) to guide it. 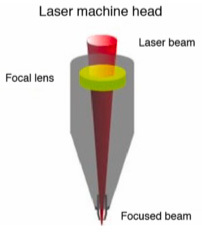 There are three main types of lasers used in the industry: Fiber Lasers, CO2 lasers Nd and Nd-YAG. TCS uses state-of-the-art Amada Ensis 3015AJ Fiber Laser that is capable cutting a wide range of metals (Aluminum, Steel, Copper, Brass, Titanium, etc) from 16GA through 1" thick Cold-Rolled Steel on sheets up to 120" x 60". This involves firing a laser which cuts by melting, burning or vaporizing your material. A fine level of cutting detail can be achieved on a wide variety of materials. The Ensis 3015AJ uses highly efficient and robust solid-state laser diodes as the photonics engine that powers the fiber laser and transfer light from the source to the laser cutting head in fiber optic cables. This enables a highly efficient, and well controlled cutting process to ensure outstanding cut quality while achieving tight tolerances down to 0.002". The kerf refers to how much of the material the laser takes away when cutting through. (the width of the groove made while cutting.) 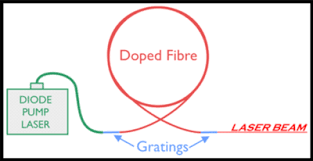 This varies from material to material and is also dependent on the laser beam tolerance i.e. the width of the beam. Punching is a metal fabricating process that removes a scrap slug from the metal workpiece each time a punch enters the punching die. This process leaves a hole in the metal workpiece. Its ability to produce economical holes in both strip and sheet metal during medium or high production processes. The ability to produce holes of varying shapes – quickly. 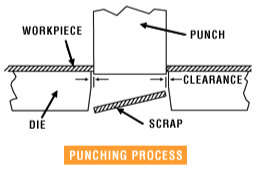 The punching process forces a steel punch, made of hardened steel, into and through a workpiece. The punch diameter determines the size of the hole created in the workpiece. The illustration that follows provides a two-dimensional look at a typical punching process. Note how the workpiece remains and the punched part falls out as scrap as the punch enters the die. The scrap drops through the die and is normally collected for recycling. Punched material is most normally in sheets. Roll material can also be punched. 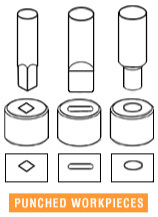 The illustration that follows shows a few common punch and die configurations and the workpieces that would be formed by this combination. Multiple punches can be used together to produce a complete part with just one stroke of the press. Forming, metal forming, is the metalworking process of fashioning metal parts and objects through mechanical deformation; the workpiece is reshaped without adding or removing material, and its mass remains unchanged.Forming operates on the materials science principle of plastic deformation, where the physical shape of a material is permanently deformed. Metal forming tends to have more uniform characteristics across its sub-processes than its contemporary processes, cutting and joining. MIG, or metal inert gas, welding is a process that involves continuously feeding a metal wire into the weld being made. The wire acts as a filler material to help join the two metal objects. TIG, or tungsten inert gas, welding uses a non-consumable tungsten electrode to run a current through the metals being joined and may or may not use a filler metal. Because MIG welding employs a consumable filler material to make welds, it can often complete welds of thicker metal objects in less time than a TIG weld. Without a filler material, TIG welding needs to get the pieces of metal being welded hot enough to form a bond with each other. Typically, this is easier with thinner pieces of metal than with thicker ones. Overall, for really thick, heavy-duty welds, MIG welding is the go-to option. For thinner pieces of metal, TIG welding tends to be the more effective solution. MIG welding is more often recommended for ease of use. The process tends to be a bit more forgiving of mistakes than TIG welding is—so it’s often recommended for first-time operators and non-professionals. TIG welding, on the other hand, requires very strict control over the timing, pressure, and electric current used in the weld. In most cases, TIG welding is best done using an automated, computer numerically-controlled (CNC) welding machine. Machines can reliably perform identical welds over and over much more easily than a manual welder could. When using an automated welder (whether it’s MIG or TIG), it’s important to get the weld settings and controls just right—otherwise, you risk repeating the same mistake over and over. Which One is Better? The answer depends on the job in question. As noted earlier, MIG welding is typically better for heavy-duty welding work where larger, thicker pieces of metal are being joined because it uses filler material. However, TIG welding can work wonders for joining smaller pieces of metal, such as the wires for a custom steel wire basket. Also, because the TIG process directly joins two pieces of metal, there’s no filler material to fail. In short, choosing one welding solution as the best should be done on a case-by-case basis, which is why TCS Industries supports a wide range of tools and technologies for completing welds. 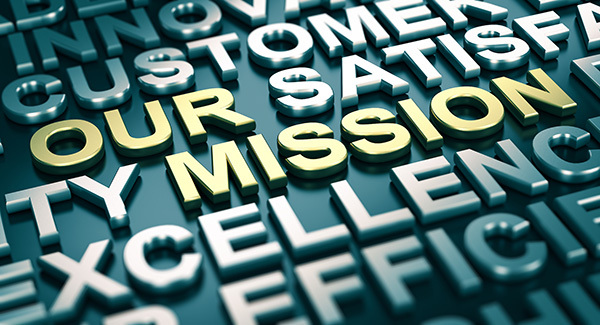 Assembly can be done depending on level of service. Please call us at (505) 292-2418 for additional information.